Join DeathSpank, in his all new adventure! Fight through war-torn battlefields, tame the violent High Plains and sail your own pirate ship through the savage seas. DeathSpank will vanquish all-new evils, help all-new downtrodden, and dispense justice as only he can. Wield exciting new weapons, slay unbelievable new creatures and get to the bottom of the Thongs of Virtue. The downtrodden cry for justice and DeathSpank will save them or kill them trying. This product supports the following languages: In-game speech: English; On-screen text: English. There are no refunds for this item. For more information, see www.xbox.com/live/accounts. 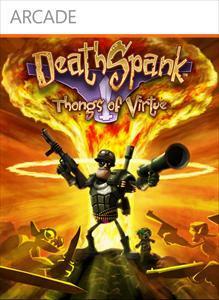 Join DeathSpank on his search for the epic Thongs of Virtue in this story trailer from the all new DeathSpank: Thongs of Virtue game. A new warrior is ready to join the battle for Justice! Tankko the warrior is half-man, half-monster, all awesome! Tankko inspires fear in enemies and slight discomfort among friends. This product supports the following languages: In-game speech: English; On-screen text: English. Join DeathSpank, in his all new adventure! Fight through war-torn battlefields, tame the violent High Plains and sail your own pirate ship through the savage seas. DeathSpank will vanquish all-new evils, help all-new downtrodden, and dispense justice as only he can. Wield exciting new weapons, slay unbelievable new creatures and get to the bottom of the Thongs of Virtue. The downtrodden cry for justice and DeathSpank will save them or kill them trying. This product supports the following languages: In-game speech: English; On-screen text: English. Be alert brave hero! A freezing yet terrifying dungeon has opened up in the Snowy Mountains! Horrible enemies of ice, flesh and terror await DeathSpank in this, the greatest expansion of all time! This product supports the following languages: In-game speech: English; On-screen text: English.